Is there a better alternative to NanoSpell? Is NanoSpell really the best app in Libraries category? Will NanoSpell work good on macOS 10.13.4? 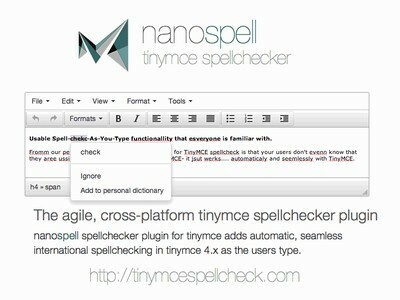 NanoSpell -- the agile, cross-platform TinyMCE spellchecker plugin which adds automatic, seamless international spellchecking in tinymce 4.x as the users type. This independently developed plugin provides automatic spellchecking within TinyMCE. It automatically underlines typing errors, and provides accurate suggestions on right click. Download NanoSpell and unzip it anywhere in your web project. Test it locally: Browse to /path/to/nanospell/getstarted.html. The page will verify that everything is working for you, and even provide personalized code samples. Univeral cross-platform spellchecker for TinyMCE editor 4.x. NanoSpell needs a review. Be the first to review this app and get the discussion started! NanoSpell needs a rating. Be the first to rate this app and get the discussion started! Code it: Just copy 2 lines of code into your tinymce.init statement to register NanoSpell as an external tinymce spellchecker plugin.